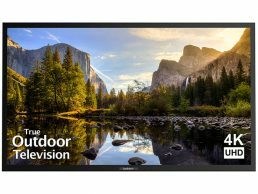 Weather-resistant outdoor TVs are designed specifically for use on covered decks or patios. They’re built to withstand the wind and moisture that they’ll experience, providing you with years of enjoyable viewing. Outdoor TVs are also created with outdoor light in mind, providing a bright, vivid picture.